The world of chess clocks is a huge and varied one. There are analogs, analog mechanical clocks and then, the digital chess clocks. When it comes to functionality, digital clocks with all their preset time controls and other features are most convenient for both recreational and serious chess players as also for serious chess learners. However, analog clocks are often preferred by chess hobbyists for their aesthetic, and often nostalgic, appeal. In the following list, we have included the bests from both worlds, so you can have an easier time making your ideal pick! We had been talking about why you may love to own an analog clock despite its limited functional range as compared to a digital chess timepiece. And when it comes to analog chess clocks, you’ll rarely meet a more beautiful, simple and elegant piece than this one. This comes from the renowned German manufacturer GARDE, often regarded as the ultimate brand when it comes to analog chess clocks. And this classic chess clock is not only analog, but it is a fully mechanical device as well. As a matter of fact, according to GARDE, the clock is virtually of the same type as the one that had been used in the Short vs. Kasparov match during the 1993 world championship. That game clock also happens to be the only mechanical chess clock used in a world championship game that is still in production today. As to the one on our hand, the elegant look of this clock owes much to its natural cedar wood cabinet tastefully complemented with minimal brass fittings. Inside the cabinet, there is a precision quality timepiece—of the kind that has pretty much become a thing of the past by now. Standing at 22cm, the clock is also a rather large one and would sit nicely with a set of classic chessmen and board. In short, an ideal item to have for simple gameplay but where you also want to keep track of how long you’re taking for your turns— without however going into too much details such as increments, delays and so on. In contrast to our preceding product, if you’re for all sorts of complex settings that you can incorporate in your game play, this DGT Projects item is possibly the best and the most advanced one you’ll get. The large display on the clock will keep you informed of all sorts of info that are important for serious chess play or training. There are as many as 25 preset modes that include standard tournament modes, action chess, blitz timing as well as popular delay types such as US Delay, Bronstein, Fischer, etc. In addition, the clock also provides 5 slots for your own customized settings and you can use them for fun variations. A successor to DGT XL, DGT 3000 is the most up to date chess timer technology released by DGT projects, so it’s little surprise that you can enjoy all these advantages with the clock. However, this particular product excels most other DGT 3000 clocks for a number of reasons. One is its larger display that we’ve already mentioned. Additionally, this clock will also show you the seconds right from the very start of the game, unlike most clocks that will show the seconds ticking only during the final remaining minutes. And on top of all of that, the product comes with a whopping 5 year warranty—a testimony of DGT Projects’ confidence in their own products and their sheer willingness to stand behind them. And as is expected, you can connect this DGT 3000 clock with all DGT e-chess boards. This ZMart Pro chess clock is a quite well-known as well as popular product among both recreational and serious chess players. The clock’s huge display, sturdy design, easy maneuverability and all this coupled with its highly affordable price are the prime reasons behind its popularity. The clock doesn’t come with those hosts of preset timings that have become a hallmark of DGT projects clocks. However, it packs just about enough control features and these are often adequate for chess learners or chess hobbyists frequenting chess clubs, etc. 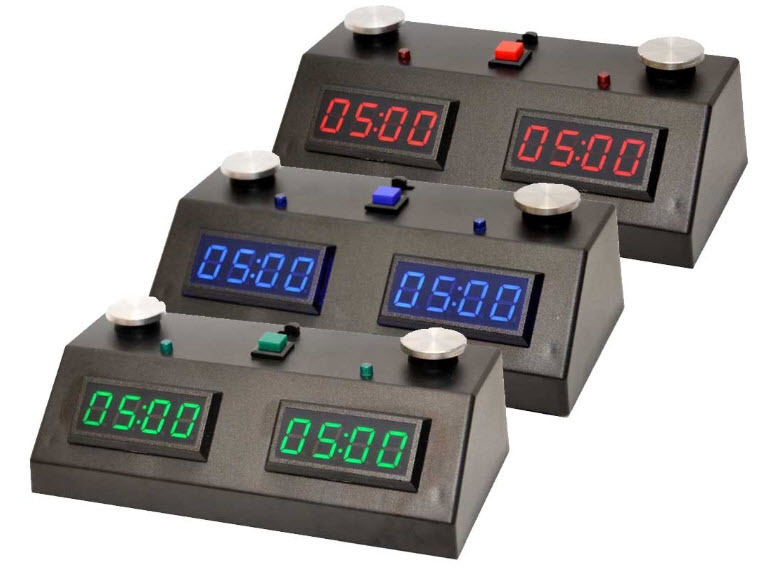 The ZMart Pro includes 2 0r 3 programmable tournament time controls as well as blitz or other common time settings. In addition, it offers three slots for customized settings, counter move options, common increments and delays such as Fischer and Bronstein as well as a host of additional timing modes that you can use for games such as go, shogi, jenga chess, scrabble, etc. Apart from the above, one unique feature of this clock is its extreme durability. The clock is housed in a sturdy steel case and also its touch sensor stop translates into greater durability since touch buttons mean that there are no inside parts that may wear down over time due to frequent stops and starts. overall, a highly practical and recommended product for everyday use. • Extra features such unique dual count, hourglass, counter move, etc. Again, if you’re into functionality, you will appreciate this DGT 2010 chess clock that comes with loads of time control and other options, many of which you may never use at all! All the same, all these different options show DGT’s earnest effort to make their products as versatile as possible. The clock is lightweight and is ideal for carrying around and you have the option to buy it with a clock bag as well. 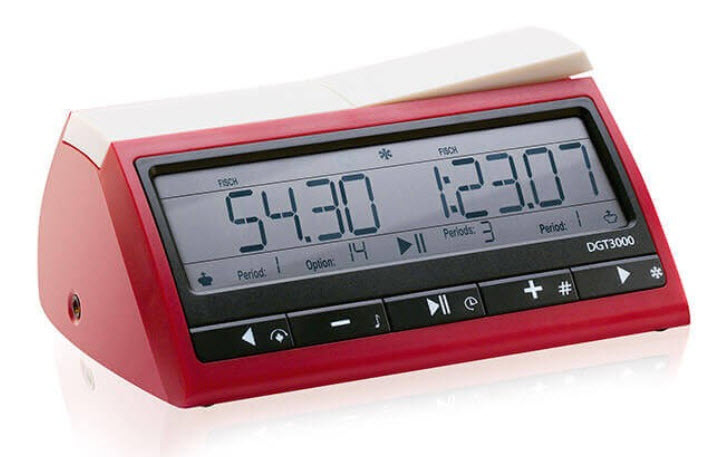 It has a convenient, large display that also includes several useful info; has a buzzer function; and is a push button clock. Apart from chess, you can also use the clock to play a great number of games (such as Reversi, Checkers, Connect Four, Scrabble, Japanese and Canadian Byo-yomi) that require a timer. One particular fact that deserves mention regarding this clock is that it is an amended version of the original DGT 2010 clock. DGT Projects, upon receiving a few complaints about their new release, was prompt enough to release a new model in the November of the same year. In this new DGT 2010, all your manual settings will get automatically saved even after you switch off the timer or use one of the preset timings. Some users had complained that most programmed settings were for non-North American events, so DGT had changed these earlier programmed settings to more popular ones. This again shows DGT’s absolute commitment and regard towards the users’ opinions and preferences. Finally, byu-yomi enthusiasts will be delighted to know that this clock automatically adds extra time once you run out of required number of moves. It’s not for nothing that the product uses the word ‘Ultimate’ in its name. If you really want a high end digital chess clock equipped with the cutting edge technology, this clock will be an ideal choice. Run in 3 AA batteries, the clock supports a whopping 850 hours of gameplay and boasts of an accuracy rate of better than 1 second/hour. Those facts alone will give you enough insight into the superior technology used in making this product. Needless to say, the clock includes all the different time controls required by both amateur and serious chess players. In fact, the product includes an 11-page manual to guide you through the use of all these different time settings! All serious chess players will be familiar with Chronos, one of the most respected names when it comes to digital game clock manufacture. When it comes to reliability as well as durability, there is little to match the Chronos products which is why you will see lots of them at any serious chess club or tournament. The Chronos GX is the latest offering from the company and features several increment and delay modes, 8 preset tournament controls, 4 blitz timings as well as customizable options. 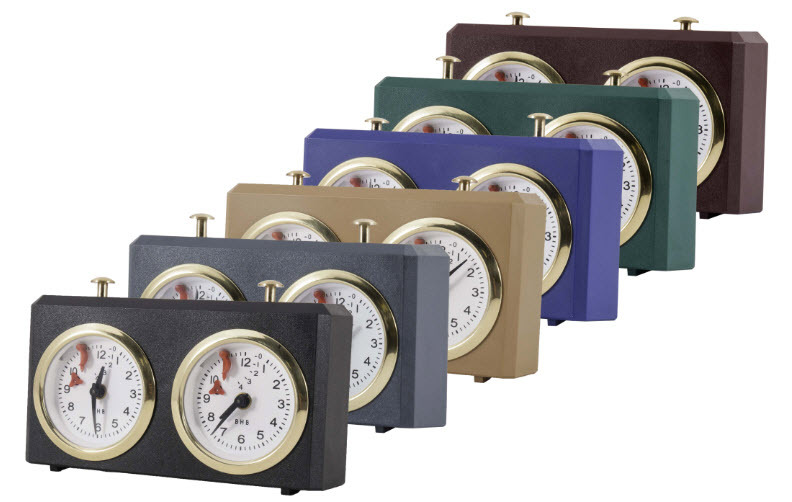 The clock is also available in five different colors and features both push buttons as well as touch sensors. We have already mentioned the ZMart Pro on our list and that clock was primarily based on the technology used for ZMart Fun II. So, when it comes to functionality, you get pretty much the same benefits from both products. But this plastic case item comes with a more low-profile design that, apart from making the product lightweight and giving it extra stability, also partly explains the hugely affordable price point at which it is offered. 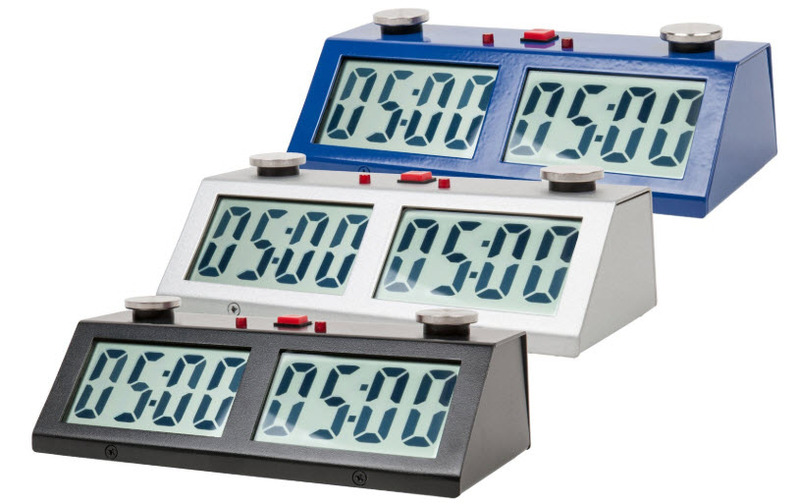 With its bright LED display, touch sensors and simple design, the clock is an ideal one for all recreational players. To come back to the analog world, this BHB mechanical clock is a favorite of ours for many a reason. For a first, it is available at a highly affordable price point, something you won’t normally expect from an analog mechanical chess clock. More, the clock, although housed in a hard plastic shell, is durable enough. And finally, the German made mechanical timepiece runs like a dream and you would never face any unexpected hiccups during gameplay. On top of that, BHB has included a 5 minute timer (something unheard of in the world of mechanical chess clocks!) that helps you manage your time all the more effectively. Well, how about a pocket-sized folding chess clock that also packs in superior functional abilities? If it sounds exciting to you, then you’ll be more than delighted by this DGT960 that comes in the puny dimensions of 5.5″ X 2.6″ X 1″ (H). However, no matter how small, the clock still packs in all the customary functions such as multiple time controls, move timer, count up/count down and more. And it is especially great for the lovers of Fischer Random Chess since it is able to generate 960 random stating situations (hence the name!). Keep in mind, however, that this folding clock supports only a single time period. And to cap our list, we would like to mention this another beautiful and elegant mechanical clock manufactured in Europe. Just like the first (GARDE) product on our list, this INSA clock features a large display and is housed in a beautiful whitish light wood frame. As can be expected, the clock does not include features such as delays and increments and as such, is not meant for tournament play. However, that is pretty much a given for mechanical clocks and if you want to settle for an analog, you definitely have other reasons in mind! And your aesthetic fervors will be amply compensated by this classic, timeless design mechanical clock. Any serious chess player knows that a good chess clock is as important as the game itself. It is an indispensable element of the game. The clock limits the duration of the game and ensures that players have the same playing time. Time becomes an additional factor for the player to manage. The basic units consist of two clock dials, each indicating the remaining time for players. After having played a stroke, the player presses the pendulum, which stops the clock and triggers the opponent’s turn. It is a double chronometer that measures the time each player takes to think about their moves (in tournaments; it is essential). After each move, the player presses a button that deactivates his chronometer and simultaneously activates that of his opponent. The start-up of the clock must be done with the same hand that handles the pieces. However, it is not mandatory to press it, such that if a player forgets to do so the opponent can make their move when they consider it appropriate. One should always allow the opponent to set the clock in motion once they made their move. It is not considered that a play is finished until the clock is pressed. The game of chess uses different types of clocks, including analog, modern, tournament, and digital variants. These are mechanical versions that were popular before digital models appeared on the market. The total time allocated at the beginning of the game to each player is adjusted (more or less precisely) by the position of the hands. For example, for a reflection time of 20 minutes, the clocks are set to six to twenty. A few minutes before the end of the allotted time, the hands raise a small flag. The fall of the flag signifies that the player has run out of time. Such clocks are still on sale in online and offline stores. Digital chess clocks, on the other hand, can be set to the nearest second and many aspects are pre-programmed. Electronic units allow the use of special cadences with an increment of time. 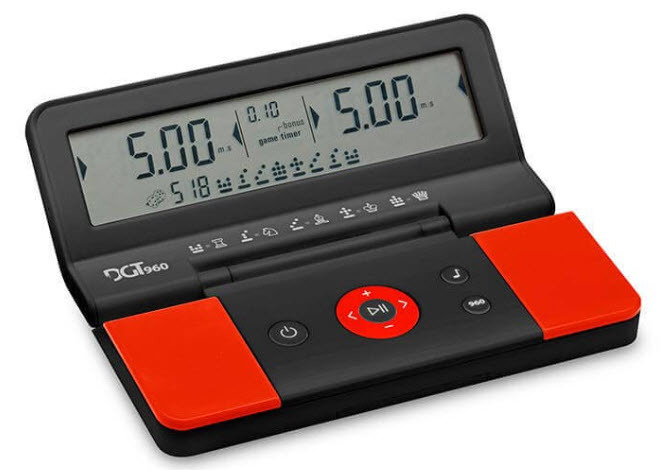 With a modern chess clock, players can enjoy the convenience of a portable unit that helps them stay focused on the game. These variants are easy to use and advanced. They come with standard features like attractive interfaces, sound notifications and pause or resume capability. The classic clock for chess has been the staple for the longest time. It provides a number of key advantages, including precision, universal recognition, durability and a compact design. Many people opt for this unit to experience the classic wind-up operation. In chess tournaments, the reflection time available to each player is measured by a special tournament clock, which has undergone many changes over the years. The modifications were in line with the rules relating to reflection time. This type of chess clock first appeared at the 1883 London tournament when it replaced the uncomfortable and challenged hourglasses. The latter had presented many drawbacks, the first of which was the difficulty of stopping the flow of sand. Analog clocks have replaced the external flag with an internal flag: a red device placed a bit above 11. This device is still called a flag. It is usually a light device, however, it is difficult for the watch to raise it. Digital clocks do not have a flag, but it continues to be called “flag drop” when the agreed time runs out. Some models indicate this with a flag on the screen. Digital clocks have the same locking system and function as an analog unit. Their appearance has allowed the introduction of more complex functions, which are better adapted to the game. 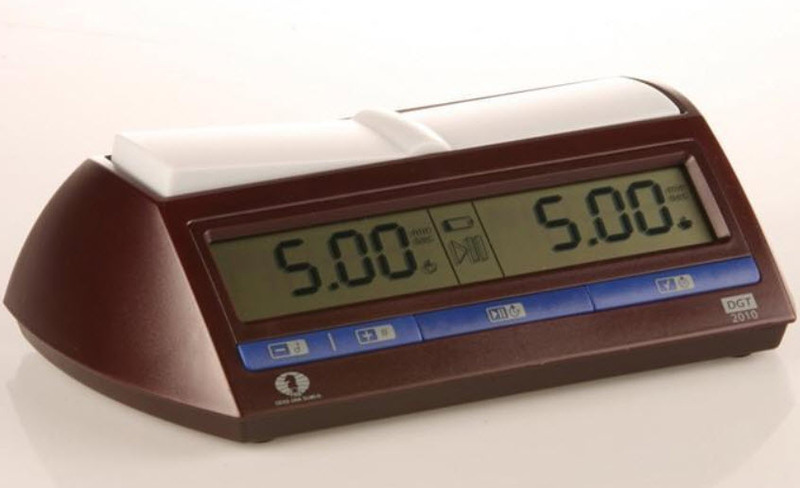 Electronic clocks can be used to program virtually any type of counting. The most powerful currently on the market can adjust sequences of up to nine different periods. A player who exceeds his time of reflection immediately loses time. However, some modifications have been adopted depending on the games. It is considered that the flag has fallen when a player claims it or the referee sees it. No one else can claim or indicate that the flag has fallen. A spectator who intervenes in such a case can be expelled from the room. If several time controls are agreed upon, it must be verified that the agreed plays have been made. The unused time in the previous control is added to the time of the next control. The position of the clock is determined by the referee. Normally it is placed to the right of the black pieces, but if the other player is left-handed and wishes to have the clock to the left they can inform the referee. If the referee has a good view of the clock on both sides of the board, there is usually no problem, but if the referee does not see the clock when it is placed on the left the black does not heed the warning. In a tournament, the clock starts at the scheduled start time, and in any case when the referee gives the order. At that moment, the black player starts the white clock. If at the start time the black player is not in the room it is the referee who starts the clock. If the game lasts less than an hour, you just have to wait for the agreed time. In any case, the time a player has to appear before the board is not the time the chess clock counts but the referee’s clock, that is, a conventional clock. If a game should be interrupted, only the referee can stop the clocks. A player can stop both clocks only to request the assistance of the referee for any claim. In any case, the referee will decide when the match will be resumed. With the classic or slow pace, each player has at least one hour to think. Often time is split into two (or more) periods. For example, you can have two hours to complete the first 40 moves of the game, after which an extra hour is added to each player to complete the game. With the fast pace, the time is typically 20 minutes for each player. The electronic pendulums allow cadences with an increment of time or Fischer rate: each time a player makes a move, time is added, for example, 30 seconds in the classic clock. A player who plays faster than the increment will gain time. The clock in an important component in a game of chess. When you start learning to play chess you must familiarize yourself in some way with the clock. Failure to master the skills required to integrate the clock into the game plan can lead to many problems. These include nervousness that comes from knowing that time is ticking, which compromises concentration on the analysis of the game. In addition, you forget to stop your clock at the end of your movement, which means a direct impact to your game plan because if the opponent realizes this error, they will take as much time as possible to think about their next move. If you run out of time, you lose regardless of your position or advantages you have in pieces. The chess regulation establishes that every championship or contest must be carried out using the clock. For this reason, you must know how to handle it. The game time assigned to each player is the mass, but the duration of a game varies depending on the type of tournament. Chess House is one of the prominent brands offering high-quality chess clocks. The company demonstrates an unwavering commitment to supplying the market with the best products that are suitable for both professionals and amateurs. Buyers can take advantage of a wide selection of clocks and other chess merchandise, including sets, electronic boards, scorebooks, cases and learning materials. The House of Staunton stocks a wide array of chess products from which to choose. 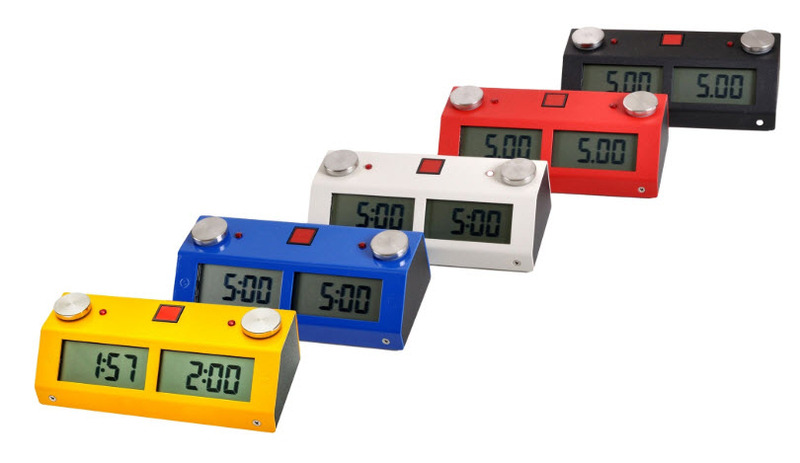 It offers chess clocks from various brands, including Zmart, DGT, INSA and BHB. 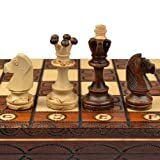 Additionally, the retailer offers own branded line of chess clocks that rival leading brands in terms of quality and durability. Buyers can also quality chess bags, boards, videos, software, books, chess pieces and much more. The retailer provides discerning chess collectors unlimited access to premium merchandise. It is a leading wholesale supplier of chess products in the United States. Chess Baron is well known for the quality and design of its impressive collection of chess clocks. 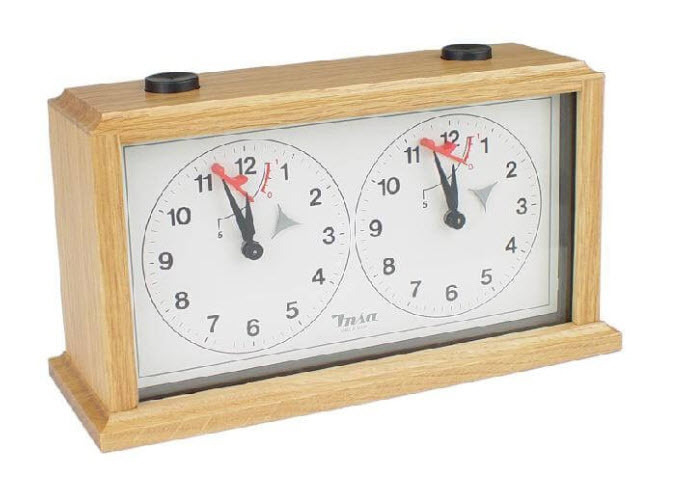 This makes it easier for collectors to make the right decision when selecting a chess clock. 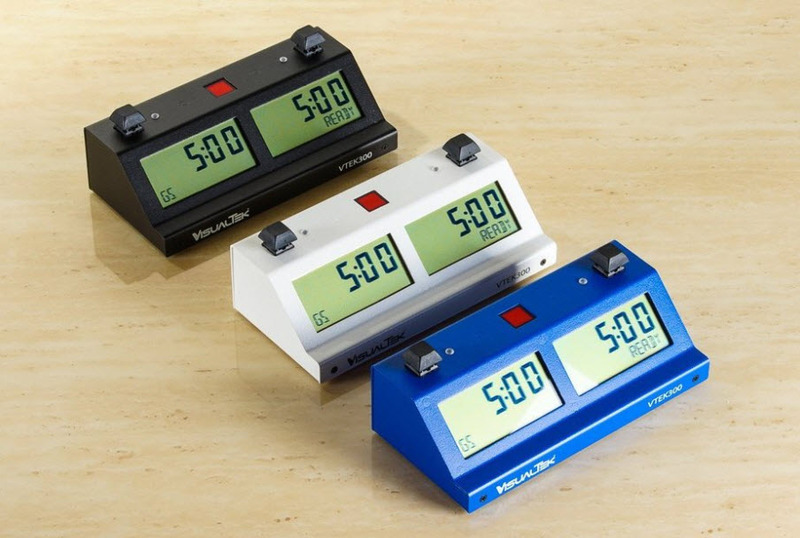 This family-owned company offers DGT chess clocks that are compatible with DGT electronic chess boards. 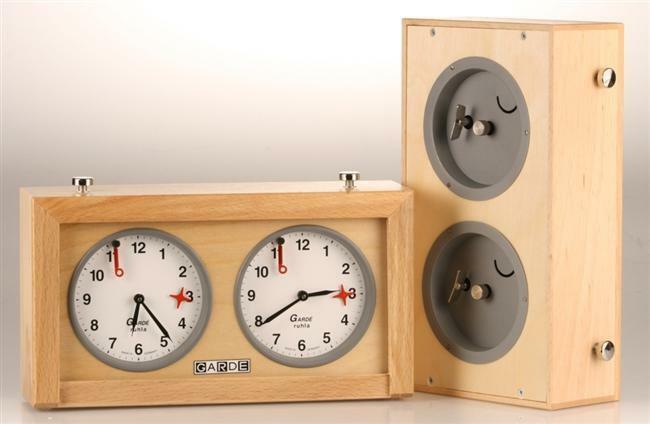 In addition, it offers clocks from recognized brands like BHB and Garde. Based in Kaysville, Utah, Wholesale Chess offers a wide selection of chess to products for reasonable prices. This online store provides a convenient way for buyers to find the best chess clocks. Wholesale Chess is known for its excellent customer service, quality merchandise and low prices. Both novices and experienced chess players will find the ideal products to suit specific needs and budget. ChessUSA has been operating for more than three decades. It comes as no surprise that the retailer is well known in the United States. It offers premium quality items, such as chess clocks, sets, pieces and boards to suit varying needs. The average price for a decent quality chess clock is approximately $40. Buyers can select the best clock from an extensive array of options. Chess players and enthusiasts can opt for free chess clock alternatives, such as stopwatches and mobile apps. These options are well suited to beginners and anyone looking for a free clock alternative. Some of the mobile applications available on the market come with time controls and other great features. This enables users to familiarize with the rules of the game before investing in a quality analog or digital chess clock available via top retailers like Chess Baron, ChessUSA and the House of Staunton.